As per sthalapurana, Bali Chakravarthy could not have darshan of the Lord during Tiruvikrama Avathar as he was under the Lord's foot. 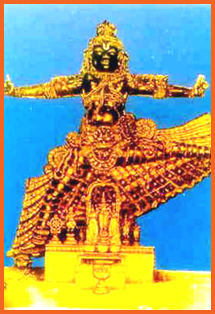 The Lord, acceding to Bali's request appeared as Ulagalanda at Satyavrada Kshetram (Kancheepuram). Ulagalanda Perumal and Ooragam are together considered as one Divya Desa. Thaayaar - Amudhavalli Naachiyaar, Amruthavalli. Thirumangaialwar - 2059, 2064, 2673 (70), 2674 (128). Access to the temple Located in Periya Conjeevaram. Within the premises of this temple are four more Kshetras. (54) Neeragam; (55) Kaaragam; (56) Kaarvanam. This Divyadesam is said to be one of the famous Divyadesam next to Sri Varadharajar Temple. This Divyadesam is found in Big Kanchipuram and is closely situated near to Sri Kamakshi Amman Temple.